Influence of limited soil on the root distribution and anchorage of Vitex negundo L.
Field pull-out and laboratory tests were applied to investigate the effect of metal bolts and wire netting on plant root distribution and anchorage characteristics of 9-year-old Vitex negundo L. growing on a weakly weathered rocky slope (38°). Root number, length and diameter were recorded and single root specimens were classified and tested for tensile strength. The results show that root anchorage is different between the two constructions by bolts and wire. Under limited soil condition, root anchorage ability is 80% lower than when there is sufficient soil due to the reduction of the diameter and number of all second-order lateral roots, as well as the reduction of the tensile strength of the embedded second-order and first-order lateral roots on limited soil. 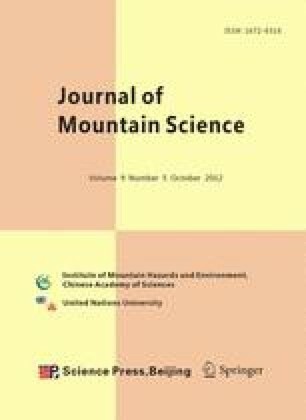 We conclude that the distribution and anchorage of Vitex negundo L. is affected by limited soil availability on rocky slopes.